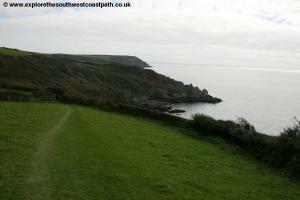 This walk links two pretty villages, Portloe and Mevagissey. The walk takes in the sandy beach at Portholland and Porthlune Cove and then becomes more rugged to head out to Dodman Point. Continuing round this headland the walk continues through Gorran Haven, around Chapel Point and on to Portmellon and Mevagissey. 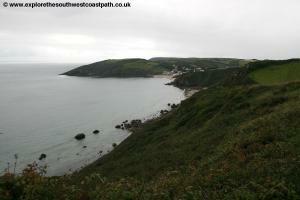 Portloe is in a fairly remote part of the Roseland Peninsula. From the A390 trunk road that links the A30 with Truro, turn onto the A3078. Pass through Tregony and continue to just after the petrol station where the road turns to the right. Here turn left off the A3078 onto an un-classified road signed to Portloe and The Nare Hotel. Continue to a point where the road turns sharply left and there is another brown tourist sign. 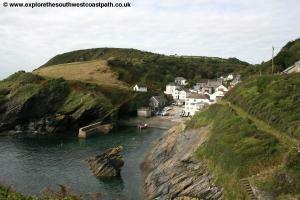 This time turn left signed for the Ship Inn and Portloe. From here on the road is mostly single track. 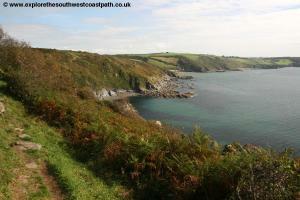 Continue with the road through Treviskey and you then soon enter Portloe. There is a small car park on the right almost as soon as you enter the village, by the garage block. This is a tarmac car park with a grass overflow area and payment is via an honesty box. Note that there is no other car parking in Portloe and the streets are too narrow for on-street parking. 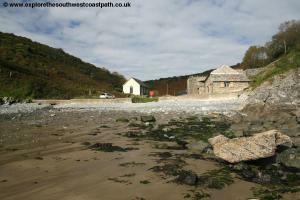 A consideration when driving to Portloe is how to get back to your car at the end of your walk. 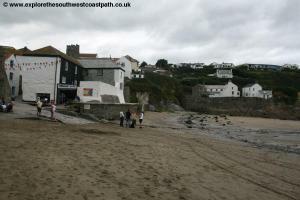 Although there is a reasonable bus service from Mevagissey it does not go to Portloe. Instead you will likely need to take a bus from Mevagissey to St Austell and on from there by either bus or train to Truro and then finally the bus from Truro to Portloe. You may therefore instead prefer to park in Truro at the start of the walk (or use the park and ride) timing your arrival to connect with the bus to Portloe in the morning, which only runs once every two hours (see below). At the end of the walk you can take the bus to St Austell and the train or bus from there to Truro, both of which are more frequent. It is also worth noting, whatever option you choose, that the last bus from Truro to Portloe is at 17:25 at the time of writing. 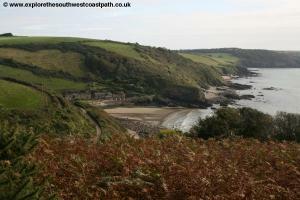 There are no buses to Portloe on Sundays. If you are coming by public transport, Western Greyhound bus service 551 goes to Portloe. This bus runs roughly once every 2 hours Monday – Saturday on a route between Truro and Veryan. The journey from Truro takes around 45 minutes. At Truro there are frequent bus connections to other nearby towns including Falmouth, Newquay and St Austell. In addition there are trains to Falmouth, St Austell, Redruth, Camborne, Penzance, Liskeard, Plymouth and points east. 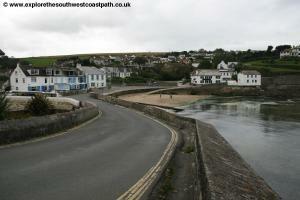 There are no buses to Portloe on Sundays. 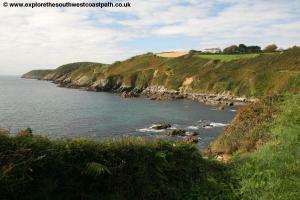 There are a couple of accommodation options in Portloe. Caradale Bed and Breakfast provide bed and breakfast whilst there is also the The Lugger Hotel which provides hotel accommodation right above the little harbour. 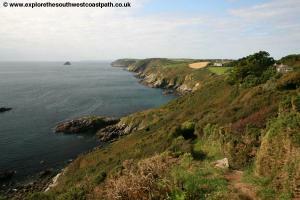 There is a wider choice of accommodation in Gorran Haven and Mevagissey at the end of the walk. Seaview International Holiday Park has a campsite as well as touring and caravans and is in Boswinger around 500 metres from the coast path. There is also Boswinger Youth Hostel in Boswinger. Portloe is a very pretty village, set around the little harbour and set into a deep valley, it is a typical Cornish coastal village. If you are starting the walk from the car park, turn right heading downhill on leaving the car park. When the road turns sharply to the right with a sea wall ahead, take the minor road on the left heading down hill (signed as the coast path). If you are starting from the bus stop, head east along the road from the bus stop and just after the road turns left, take the road to the right going downhill. Follow this narrow road around a little valley and up on the road the other side in front of a row of cottages which soon becomes a track and then a footpath. 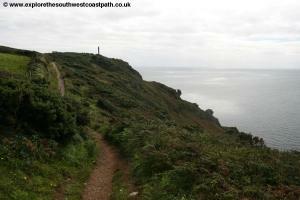 This climbs up to Portloe point offering fine views back over the village. 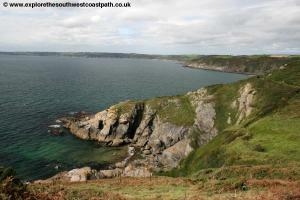 As you round the corner of Portloe Point you have fine views round to Dodman Point. 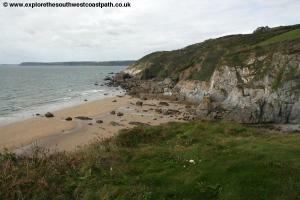 The coast path ahead sticks right to the cliff top around Hartriza Point and crosses a little stream then rounds Cargloose Point where you climb up and then follow a wide track along the cliff top. You then round a couple of little rocky beaches near Treganna. Here the path heads left a little away from the coast to join a junction of paths where you turn right heading due east which you follow down to West Portholland. 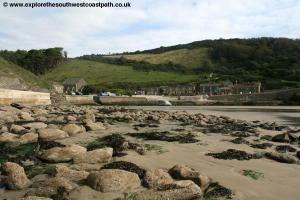 This is a rocky beach at high tide but has plenty of sand at low tide and is backed by a small village. West Portholland neighbours Porthholland just a couple of hundred metres apart. Here you have a choice. If the tide is low you can simply walk along the beach to Portholland but if it higher you have to take the minor road which runs just along the low cliffs at the back of the beach. If you walk on the beach, take the first step of steps up through the concrete sea wall, as a stream flows along the beach a little further along and take care is at can be slippery. Portholland is a pretty little village which largely consits of a single row of cottages and a chapel. For such a small village it is something of a surprise to find that one of the cottages houses a post office and small store. Follow the sea wall around the back of the beach and continue on this right around the little beach. 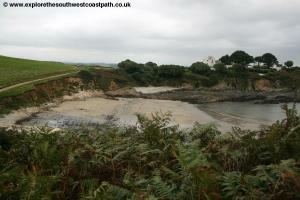 As this track zig-zags around the back of the cottages you then fork right on the well signed coast path. You follow this good quality track along the low cliff tops and the track graudally moves away from the cliff top with trees and bushes to the right. As it enters a field, turn right heading due south back to the cliff top and then follow the path along the south edge of the field and into the next field, continuing on the south edge. At the south east corner of the next field, turn right to follow the eastern edge of the field now above another good beach, Porthlune Cove. Follow the path that descends down to the road here. There is a path on the right (through the car park) that leads to the beach which is large and sandy with some dunes at the back. Porthlune Cove is a very picturesque spot with the wonderful Caerhays Castle at the back of the beach, and it's associated gardens. The castle, which is in fact a manor house was designed by Johns Nash (who also designed the Brighton Pavilion) and has a lovely setting overlooking this otherwise undeveloped beach. The castle and it's gardens are open to the public during the spring and early summer. Despite it's fairly remote location the beach is often very busy, as there is a large car park and toilets at the back of the beach. 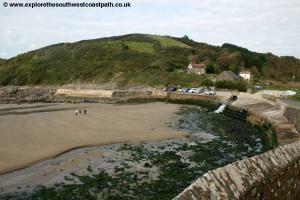 The coast path continues along the road at the back of the beach, passing the entrance to the castle. Just after the entrance you fork right on the path off the road, heading up hill and aiming just to the left of the trees you can see. At the trees you then turn right just beyond them, with the trees on your right and soon returning to the cliff top with excellent views of the beach below. The path ahead then turns right onto the wooded headland of Black Rock where you pass partly through the trees and then enter a field. Follow the south edge of this field and into the seconfd field. Part way along here you turn right keeping the bushes on your right and when these end you turn right on the obvious path heading south east, crossing a little bridge and back to the cliff top above Lamsowden Cove, which is a small sandy beach, but not accessible. The coast path from here is obvious, just stick to the wide coastal path through the National Trust land at Greeb Point where you have another descent down and back up over a little footbridge. 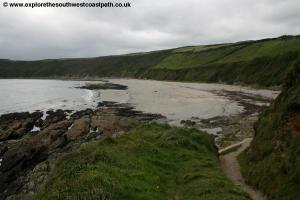 The path then heads east, an obvious path and soon with wonderful views of Hemmick Beach ahead. 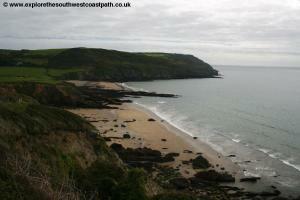 This is a wonderful rock and sandy beach which reminds me a bit of Bedruthen Steps on the north Cornwall coast. At high tide the beach is almost split into two different bays and at the eastern end, there is access down onto the beach where there is a small car park and a couple of houses. 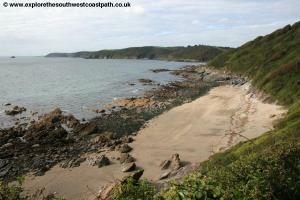 The path ahead now rounds Dodman Point. From the back of the beach take the road and almost as soon as the road turns away from the coast turn right on the coast path. 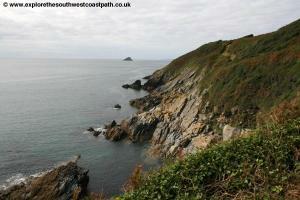 The path is easy to follow here just keeping to the coast on the west edge of Dodman Point. Soon you pass an ancient earth work on the right and continue on the path along the edge of a couple of fields. At the south end of Dodman Point is a stone cross which was originallt built for navigation reasons, to alert boats to the presence of the headland. 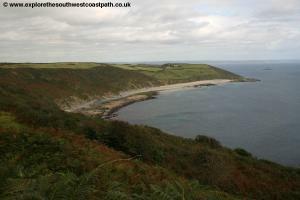 You now turn a little to the left to head along the east side of Dodman Point on a path which is mostly along the edge of fields. Soon you have another good beach ahead of you, Vault Beach. 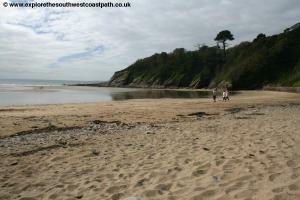 The coast path goes along the cliff top at the back of this beach which is a mixture of shingle, rock and sand, with more sand at low tide. The path goes along the back of the beach with a road close by and as it starts to turn left away from the beach, take the path off to the right to re-join the coast path. As the path begins to go round Cadythew Rock there is a path leading down to the beach but be aware that it is a long way down (and back up). 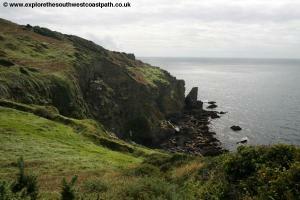 The coast path now hughs the cliff top for the next half or mile or so down to Goarran Haven. 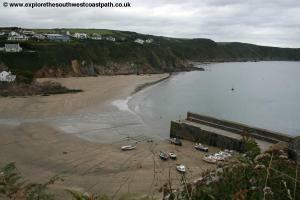 Gorran Haven has another good sandy beach with a small harbour at it's south end, protected by a sea wall. 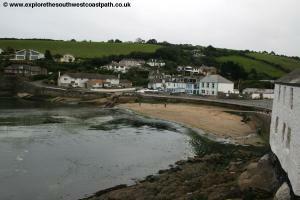 The village behind the beach is typical of many Cornish coastal villages with hilly narrow streets and white-washed stone cottages. 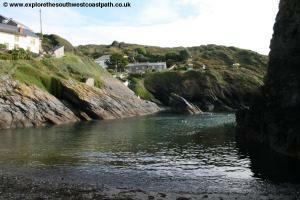 The path descends from above the harbour and behind a couple of houses until you reach the access for the beach. 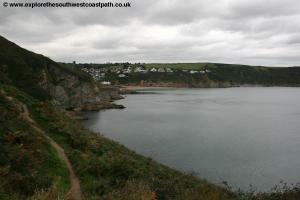 To continue the coast path head up Church Street ahead, passing the church on your right. At the end of this road, turn right into Cliff Road. 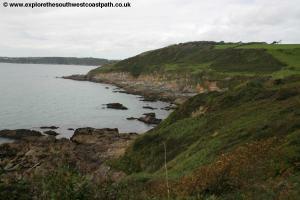 As the road ahead becomes Perhaver Park, turn right onto what is still Cliff Road passing a few more houses where the road ends and you then turn left at the coast path sign and follow a field edge path with a small beach below, Great Perhaver Beach. 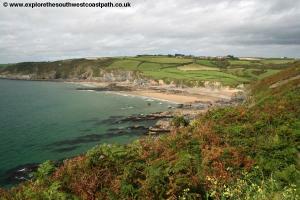 You now follow the obvious coast path right along the cliff top here heading to Pabyer Point. 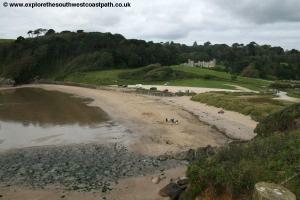 After a little over a mile you come to a small sandy beach with some National Trust owned cottages. Here take the track along the back of the beach and cross the road leading to the houses on the right and continue straight ahead on the signed coast path which soon re-joins the cliff top. After a while this joins the road, Chapel Point Lane that lead to the houses we just passed. You continue on this road as it soon reaches the first houses of Portmellon. Initially you have houses on both sides, limiting views of the coast and when you reach the end of this road, turn right to head down along the road around the back of Portmellon Cove. There is a small sandy beach here but it is mostly covered at high tide. 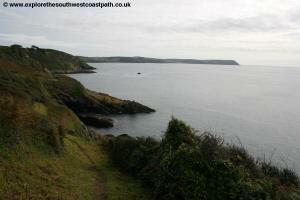 For the next mile or so into Mevagissey we follow the road for most of the length. Keep to the coastal road which soon comes to a T-junction. Here you turn right and keep on the coastal road which soon goes round the corner to give you views over Mevagissey harbour. This is one of the largest harbours on the Cornish coast and although fishing is much diminished in comparison with years past there are still a large number of boats to be seen in the harbour, which is split into an inner and outer harbour. Parallel to the road are some pleasant gardens and you can follow the path through these and then heading right away from the town to come down onto the harbour wall. Turn left here, past a small car park and follow the sea wall round to reach the back of the harbour where the facilities of the town can be found. 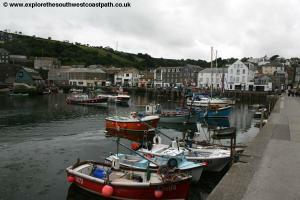 Mevagissey is a lovely village with narrow steep streets and is something of a tourist magnet. It is best enjoyed early in the day when it is less crowded and the number of cars trying to drive through the narrow streets is less. 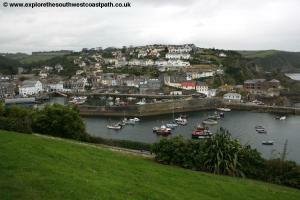 Mevagissey definitely deserves some time to explore if you have the energy! To reach the bus stop, at the north end of the harbour turn left along the cobbled street. At it's end, turn left and then right. As the road begins to climb and you near the car park on the right, the bus stop is on the left just at the end of the ice cream shop. From Mevagissey Western Greyhound bus service 526 runs hourly to St Austell, seven days a week. During the summer months some additional services run to provide a more frequent service. To get back to Portloe is something of a pain, however. The bus from Mevagissey goes to St Austell and passes close to the railway station but no longer serves the bus and rail station directly, a rather odd decision. However the stop in Kings Avenue is close to the station. To get back to Portloe however you need to change buses (or to the train) again. From the bus and railway station there are broadly hourly trains to Truro or buses twice an hour on First Devon and Cornwall route 27. The latter is recommended and you can take the 27 either into Truro directly or it may work out better to alight at Probus Square as the bus from Truro to Portloe stops there, avoiding the need to go into Truro centre. Finally, Western Greyhound service 551 goes from Truro and Probus to Portloe (no Sunday service) although at the time of writing the last bus to Portloe from Truro departs at 17:25 and Probus at 17:40. Ordnance Survey Explorer 105 covers the Roseland Peninsula and is available from bookshops in the area and nationwide as well as from on-line retailers.